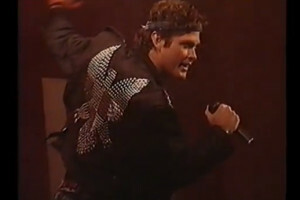 The video entitled Swim for your life out of the GDR! 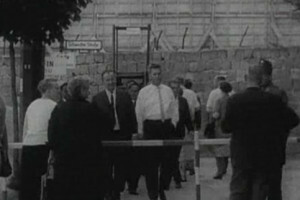 on YouTube shows a daring escape from East Berlin across the River Spree near the Reichstag. 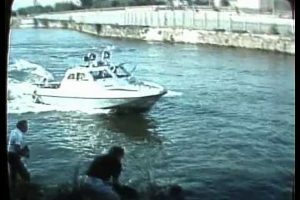 The film starts with a shot of the river facing the Fernsehturm as the narrator sets the scene and then cuts to amateur footage of the escape attempt. It is Sunday, 21 August 1988. Two figures can be seen swimming towards the camera as excited voices cheer them on. 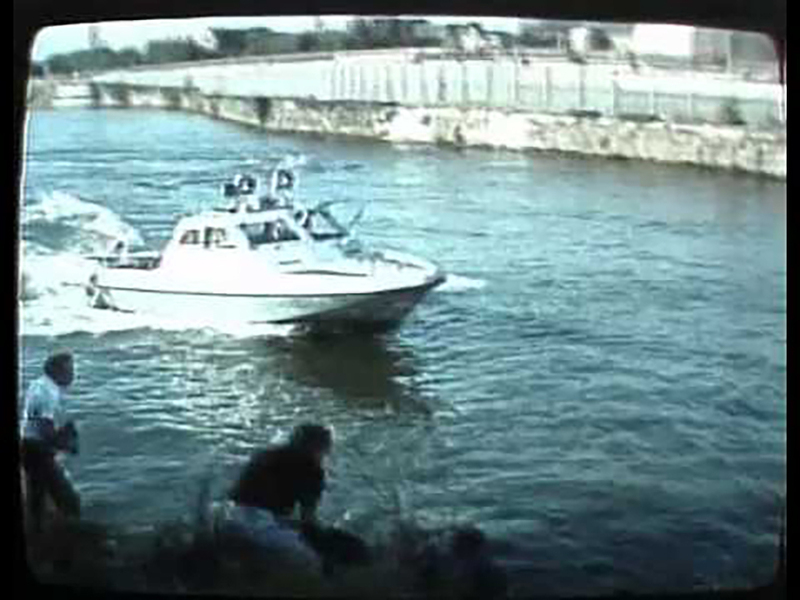 As the first swimmer reaches the West Berlin bank of the river, a speedboat carrying armed guards comes into the frame. Brave onlookers move closer to the edge and pull the first escapees out of the water. “Hey, well done!”, shouts someone from the crowd off camera. In total 3 men and 1 woman risk their lives crossing the river to escape from East Berlin for the hope of freedom in the West. Exhausted from the swim, the woman is unable to heave herself out of the water. She clings to the bank and gathers her strength. As the speedboat approaches and guards shout for her to abandon her escape, a friendly hand heaves her up onto dry land. An Associated Press release from the following day names the woman as Maiga Adryan and reports that she was three months pregnant and broke her foot during the escape. 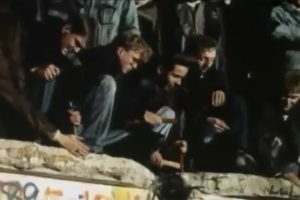 The footage, which was shot by a foreign tourist, was part of a longer Kontraste report on escapes from East Germany broadcast on 27 September 1988. Kontraste is a long-running political magazine show, then produced by Sender Freies Berlin (SFB) and now Rundfunk Berlin-Brandenburg (RBB). The full programme, Nichts wie raus: Flucht unter Lebensgefahr (Got to get out: Life-threatening escape) is available online via the Bundeszentrale für politische Bildung (The Federal Agency for Civic Education). The YouTube user timor64 added subtitles to a 2-minute clip so that he could show the spectacular escape from East Berlin to friends – at the time of writing it has over 800,000 views.